The image of the artwork portraying a rapid train has gone viral in Japan. There’s a lot of ways you can show how much you love your job: Get to the office a little early, bring cookies, maybe grab your boss a coffee. Or you can make a giant mosaic honoring high-speed trains and put it up in your place of work — the Nishi-Umeda Station. The latter was recently done by a mystery employee who has worked for the Osaka Municipal Transportation Bureau for the last 30 years. The employee painstakingly put together the mosaic with tweezers over the course of 300 hours — time the individual spent at the station after their shift ended. The Japan Times reports that the 46-year-old employee created the mosaic of the new 20 series rapid train unit out of pride for the rail service. The train is depicted through 153,600 fragments of passenger tickets that have placed back and front in order to get the black and white shades. The image of the mosaic has gone viral in Japan since it was first captured at the Nishi-Umeda Station. Within the first 24 hours it was retweeted more than 30,000 times. While the mystery employee told a spokesperson they were proud of the mosaic, they may be looking for a new hobby. “I won’t do it again,” said the artist. Fair, this poses a high risk for paper cuts. 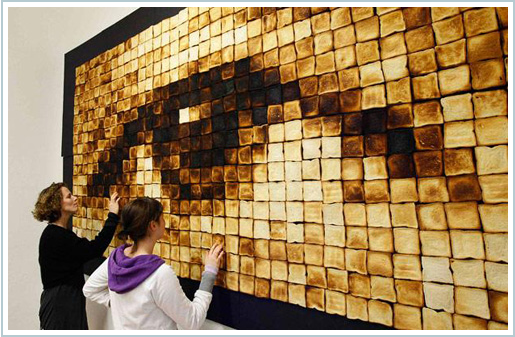 Perhaps the artists can move on to toast art next.